Early start as a hydraulic pipe had to be changed before nipping out to set up a little string of creels for some very important guests due to arrive at 9.30am. Yet another peaceful start to the day with a little mist lingering. Changing the pipe confirms why I am no engineer, job done in just under half an hour while I am sure it was really a five-minute issue. 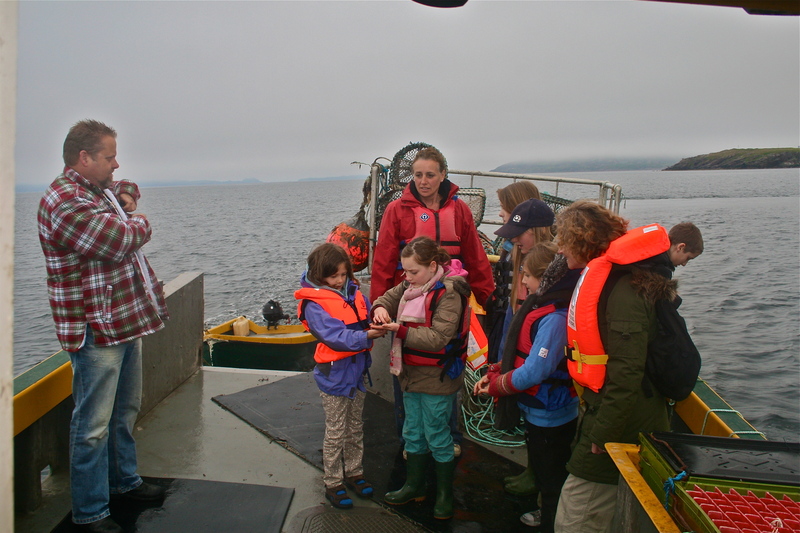 So it was out to the creels to make sure all was well and then in to the pier to await the kids. Six turned up with teach and a couple of parents and of out we went. Only out to east of Saint Island or to give its Gaelic name Eilean nam Naoimh. 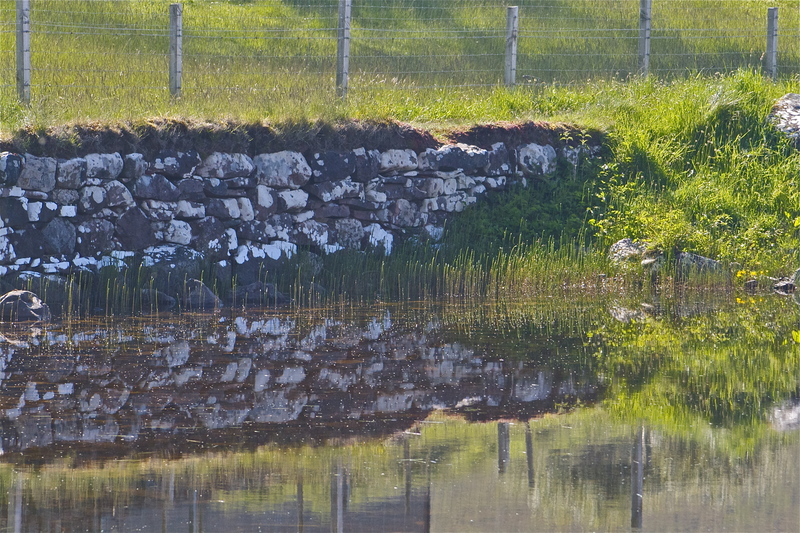 This is where it is traditionally thought that Saint Maelrubha spent his first night in Applecross. There was a fair bit of excitement aboard but all was under control with life jackets and cautionary words. 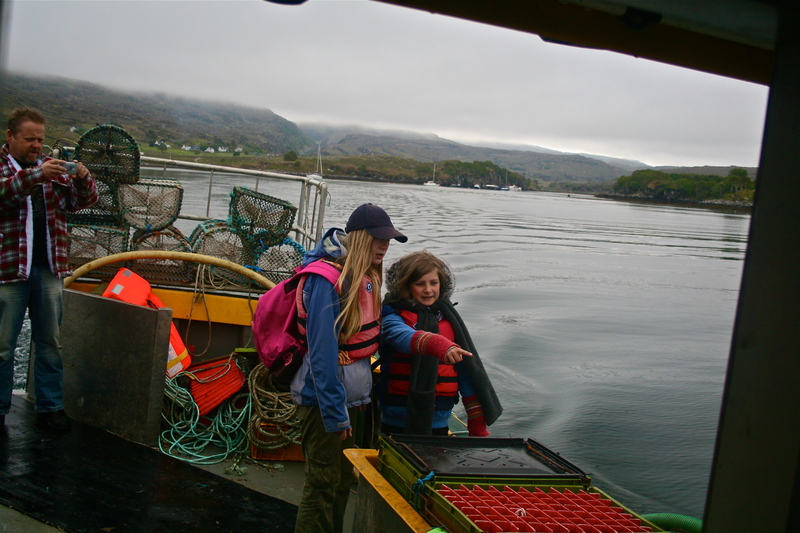 We hauled two crab pots but the crab fishing is really poor just now and only had one fairly small specimen to show them and Zoe had already caught a massive one with her Dad. Certainly fishing potential there for telling fisherman’s tales. The prawn creels were far more interesting with a variety of crabs, shore/green, velvet, spider, and swimmer crabs. A wee cuttle fish made an appearance alongside several dog whelks of various shapes and sizes. The catfish raised the interest levels, A few star fish also found their way in, both common and thorn. Mysteriously a big prawn was in each of the creels but they did not create too much interest. They seemed to enjoy it and back alongside the jetty I was asked a series of very intelligent questions. Afterwards I found the first question the most difficult to answer.” Why did you want to become a fisherman?”. 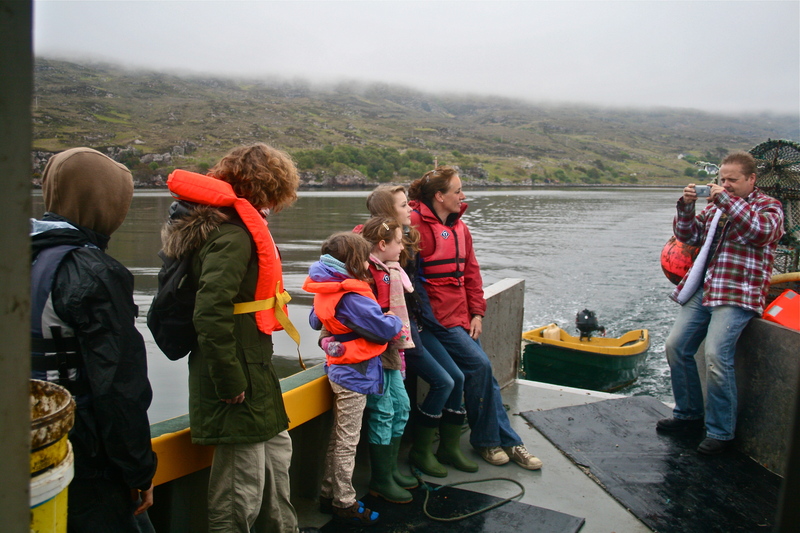 When I left school I joined a creel boat for 6 months before going to Edinburgh and it was a job. several of my holidays I was back on board boats and still never gave it a thought that I would be one. Coming back to Applecross with little or no useful skills it was back to sea, this during Maggie’s first big recession. Then bought my first boat still with not a lot of forethought and a mix of single-handed fishing and buying/building a bigger boat had me struggling on. It was only with the Varuna and major changes in life style saw me immersing myself in the environment of fishing and really trying to fish sustainably. I always feel that I have fallen into what I do. The one thing that has stuck in my mind, twenty-five or so years ago an elderly neighbour told me “the sea was in my blood” It took me another fifteen years to recognise her perceptive remark. Maybe she knew she was on safe ground with my Dad, grandfather and uncle all spending time at sea. Quick trip up the road where Mike was leaving with another group and the mist slowly burning off. Dropped off the borrowed buoyancy aids. The late morning and afternoon were spent in the garden resowing beetroot, starting off more broad beans and peas. watering and weeding. 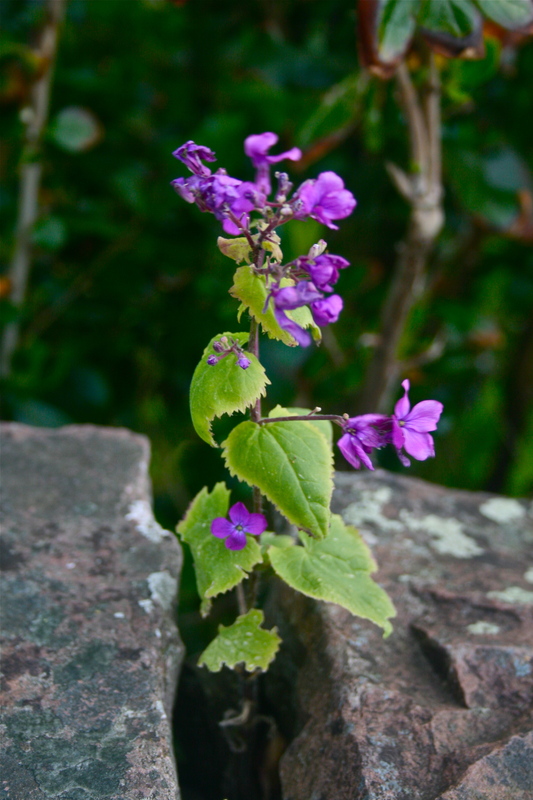 Despite all the nurturing I do I often find nature just gets on with it as this example on the wall. You would not think there was much nutrition up there. Absolutely glorious weather all day into the evening and it was off up to the Inn after falling asleep and missing out on a Camusteel barbecue. Busy, busy evening and although must have walked miles back and fro to the Garden where the majority of people were eating felt a lack of connection with the customers. It was busy and every one enjoyed the fare on offer. It was the turn of the kitchen to get panned as there were so many more seats to feed. Strange how weather affects a shift, poor weather and front of house is spinning trying to find a seat for the customers. Today starts with a prawn delivery and very noisy birds, followed by a full on shift. Not knowledgable on the subject so have no idea what was making the noise. Calm still morning on the way to the Inn. We call them relentless but enjoyable with lots of good connections. Met a guy who claimed he was conceived on St Kilda. Quite feasible going by his age and knowing the evacuation took place in 1936. Lochcarron, Germany and Inverness turned up today to get fed, well it seemed like it at five when I headed for Toscaig with Aron and the dogs to clear my croft for ploughing as a precursor to sowing the meadow. Sara and Aron live in my grandfather’s old house and he would not recognise it now. It was the other night I noticed how lovely it looks and thought the camera would have to come down next trip. The wooden end is being renovated and is going to be an ice cream parlour, possibly the first here. So now it is some oatcake, followed by some rum and raisen and a new wonderful raspberry ice-cream courtesy of Aron. 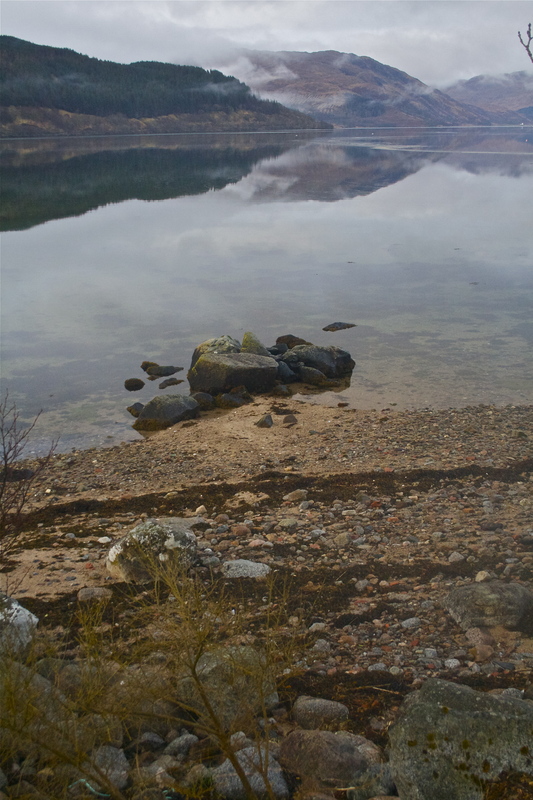 An overnight trip to Strontian has meant that I have been to a beautiful part of the Scotland for the first time. We had been invited down to give presentations about what is happening in our communities and the benefits of community consultations and development plans. Alison and Angus were lined up to give a couple of talks to a meeting held in Strontian Hall set up by their community company. After yet another reboot of the Filling Station in the morning, loaded up of a couple of bags and with Dougal and his supplies on board we set off to meet up with Angus and family from Sleat prior to a 6 pm start. 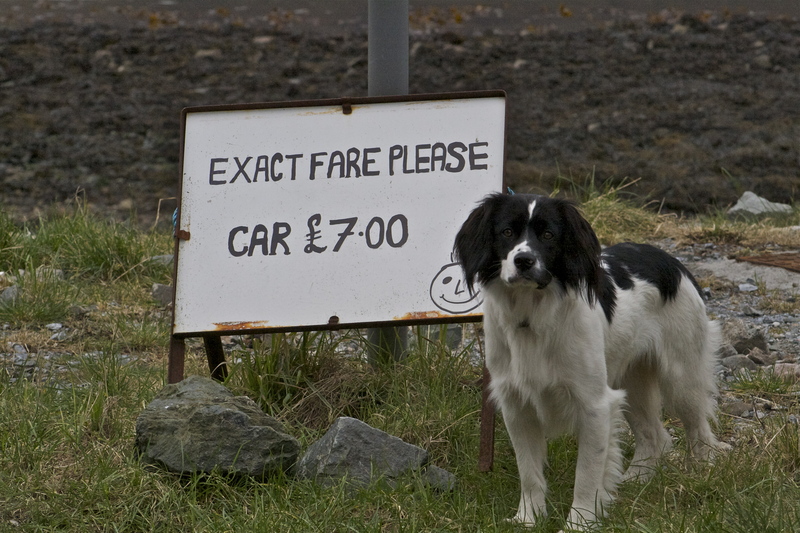 Although I have passed it on numerous occasions I have never been on the Corran ferry. The brief chat with the ferry man was very underwhelming, from his perspective there was very little inspiring in his job. Dougal got out for a bit of fresh air while waiting for the ferry to come back across the narrows. Arrived in good time to give Dougal a walk, have bowl of soup, check in to the Strontian Hotel and then down to the Hall.I had nothing to do but sit and listen to the two presentations and although I know what is going on in Applecross hearing what our Community Company has done in the last four and a half years compacted into a 30 minute talk, it sounded very impressive. Angus spoke about what is happening in Sleat of which, being in the network, I have a good knowledge. There were not many questions but there was a very encouraging turn out of over 90 interested people and all supportive. Always with these events you end up in really interesting conversations. Met up with some one who had sent a much-needed and very supportive e-mail when we were getting all the attention during the Land Action Scotland campaign last year. When you are getting swiped from all directions support from people who know what is really happening is invaluable and it is always good to meet up with like-minded folk. Both presentations were really appreciated by the organisers and it was back to the Hotel for a bite to eat and an early bed. 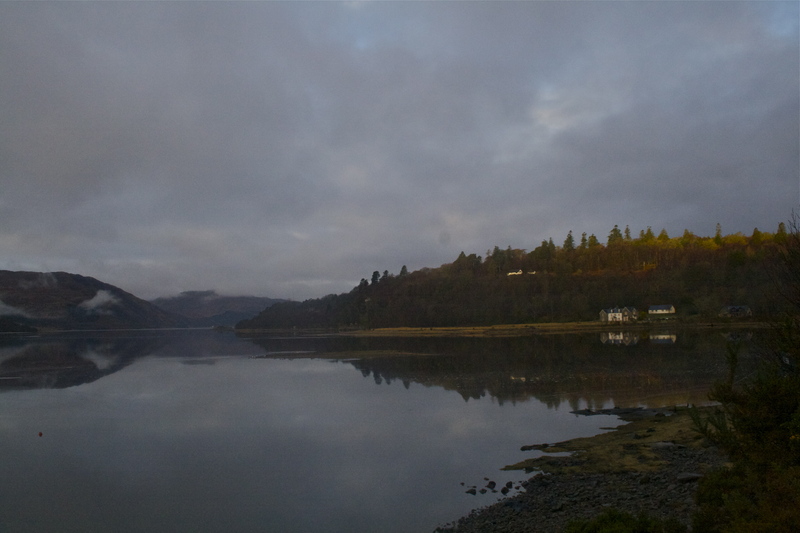 Wonderful still morning at the head of Loch Sunart and Dougal was all set for his morning jaunt. So peaceful and still as we walked along the shore for a mile or so with Dougal investigating everything. Lots of conversations over breakfast as the hotelier was none other than James from the SEA course. Good to get some advice and a little information regarding the next meeting of our newly founded Fishing Federation. Hopefully the problems are only teething and can be sorted without any casualties although not too hopeful. Back home about half twelve and straight into a shift at the Inn. Judith is having a hard time , full of the cold and a leaking hot water tank. This had to be drained as the last thing you want is 100 gallons coming through the Hotel. A microwave oven blowing up did not help matters. Busy lunch shift finished off with the Lochcarron musicians coming over. One of our Strontian conversations was trying to describe why Applecross has the appeal for so many people. I always find this hard to describe as I think a lot it is indefinable. There are many obvious attractions like the good food and welcome visitors receive but the peace and calm many people describe as they arrive over the Hill is something different and this was part of another conversation this afternoon which dipped into talking about “spiritual aspects” of the place. I have often thought that Maelrubha arriving here was no accident and the old name for Applecross is translated as The Sanctuary. It is always this train of thought that sees you through the various disputes that come your way. This was a topic over the last couple of days and it seems that as soon as a group of people who get together who try to improve conditions within their community they inevitably arouse suspicion as to motivations or have people question their actions. Maybe the fear of change amongst older folk is a factor. This seems to be the case whether it is Strontian, Sleat or Applecross. Another chat about the Company and its activity took place towards the end of the lunch shift and this was overheard by another customer who introduced himself as someone who works with partnerships and has a different way of looking at how to progress through difficult obstacles. One example was instead of buying the turbines for the hydro scheme it may be an option to lease the technology from the manufacturer thus cutting down on initial capital costs and spreading it over a longer period. Remarkable couple of days and you realise the huge capacity in this area and the offers of help and advice seem to be all around. Energy levels being well down just going to post the article I was asked to write for the tourist magazine suggesting a few reasons why you would want to visit Applecross. The quality of writing is far greater than the normal due to it being proof read by Sara. Be interesting to see how much the article is edited. It is impossible to capture Applecross in one photo so I’ve put this one in because I like it so much and it is just about the opposite of today’s weather and sentiment. Ruairidh took this three years ago with his Sony, the one I dropped in the Sound. Nice to have a couple of weeks like this. 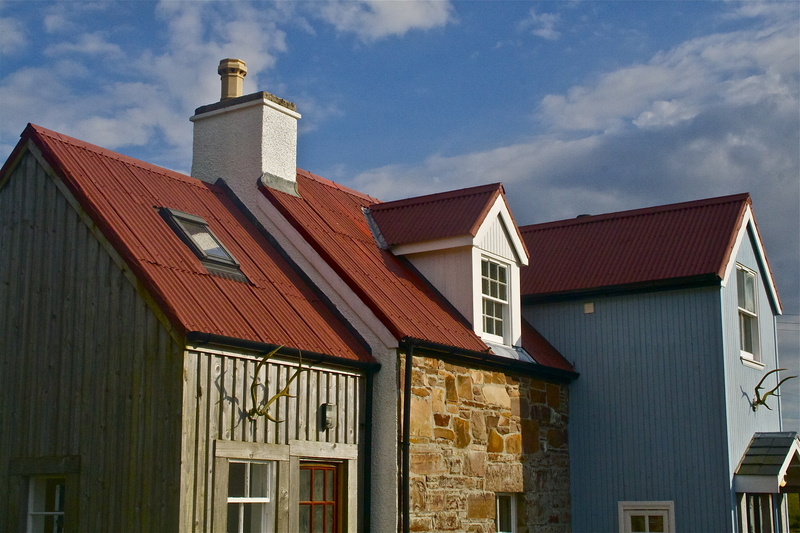 Whether you come in for a day or spend a week here you will find a timeless quality about Applecross. Often people forget what time of day it is or even what day of the week. It is a place for de-stressing and finding out what is important in life. Driving into Applecross over the spectacular Bealach na Ba, an old cattle-droving pass that crosses the mountain, you realise you are somewhere just a little different. If you stay a while you will come to know the meaning of the old Gaelic place name, A’Chomraich, The Sanctuary. In times long gone there was a six-mile circle of stones marking a safe haven for miscreants who needed to escape the unruly world outside. 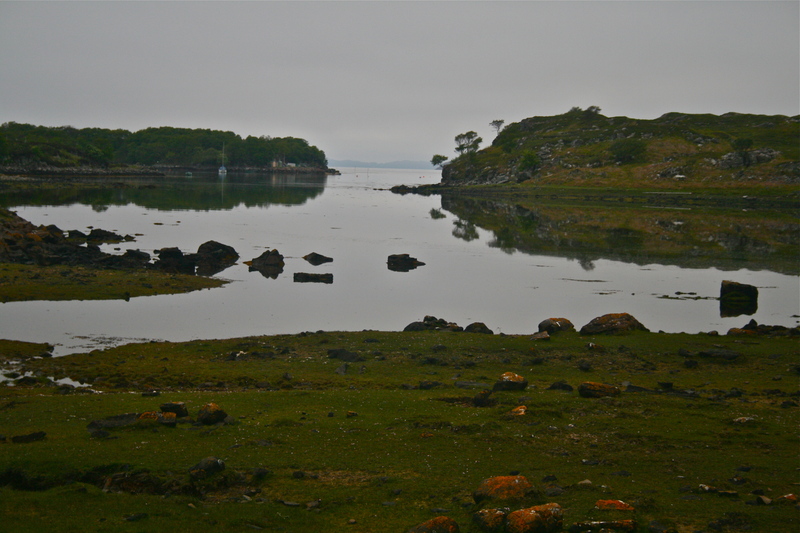 That is not to say that it was peaceful here, going by the mix of Gaelic and Norse place names scattered around the peninsula, there were a fair few visitors, not all of them welcome. The view-point on top of the Bealach – of the Inner Sound through the Blind Sound past the cliffs of Staffin and beyond, where you can see the hills of Harris – is a fine introduction to your stay here. Although Shore Street can be described as the “centre”, the crofting townships are spread over a thirty-mile car journey from Toscaig to Inverbain in little five- to ten-house hamlets. 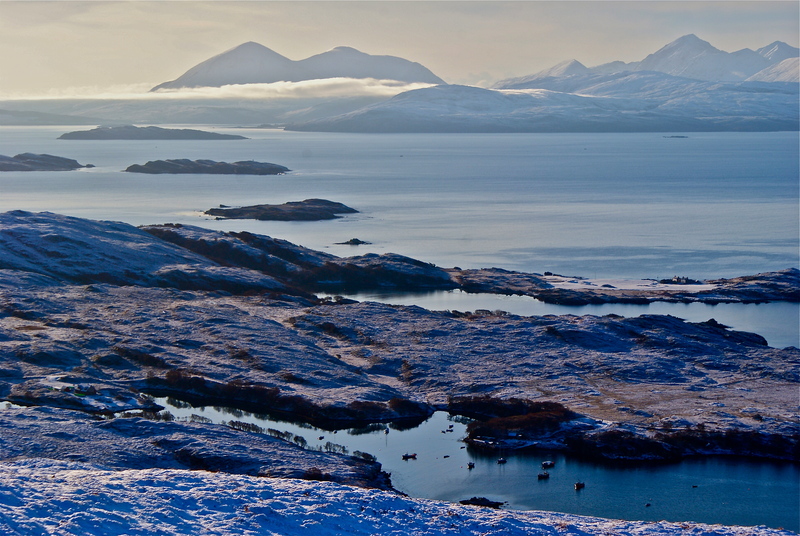 Once in Applecross, you are welcomed with an array of wildlife, eating establishments, outdoor activities on land and sea that could keep you occupied for a couple of weeks. There are several establishments providing accommodation from camping and cabins to self-catering and ensuite bed-and-breakfast and hotel rooms. Through out your stay you will be struck by the warmth of the community. 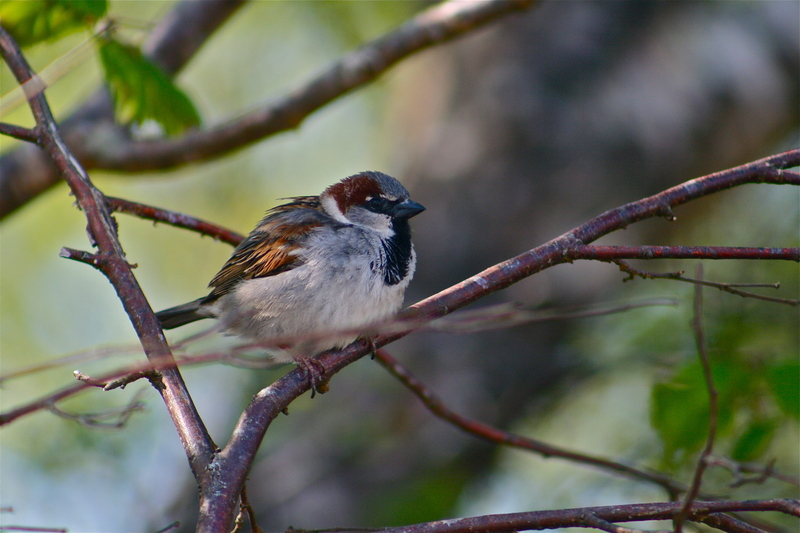 The bird life is prolific: resident golden eagles and the visiting sea eagles from Raasay and Shieldaig, divers − black- and red-throated, as well as the rarer northern − cormorants, oystercatchers and curlew on the shore, mute and whooper swans on Milton Loch. The flora and fauna around the lochside and through Carnach Woodland are of particular interest; for example, 140 species of lichen have been documented from the woodland, of which four are nationally scarce. On the way out fishing I often pass twenty to thirty seals on the rocks of Culduie, and there is a healthy sea otter population from Toscaig to the Bay. Around the Bay, a well-established path network stretches from Clachan round Applecross House, known locally as “the Big House” back to the Coal Shed. These include an archaeological trail, the “Lost Path” and a quiet stroll through Carnach Woodland, one of the oldest hazel woods in Scotland. On these walks red deer, fox, pine marten, and the occasional badger can be spotted. For those who prefer a longer walk, the old coast road to Sand has stunning sea views and the path through the Glen to Kenmore takes you over heather moorland. 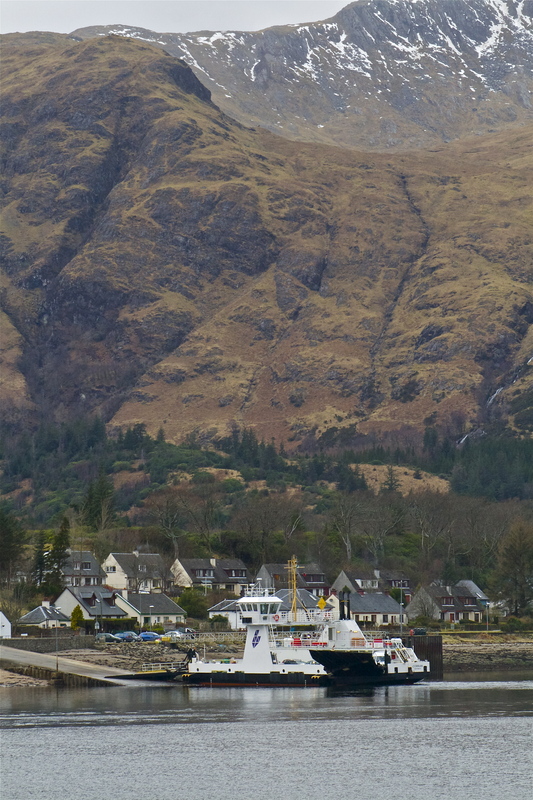 To the south, the walk to Airigh Drishaig from Upper Toscaig gives brings you to a different view over to the little harbour of Plockton and the Skye Bridge. The beaches are also a feature of the area. The secluded beach of Cuaig is well worth the walk; the more popular beach of Sand – from where you can see the occasional Trident submarine! – is known for its shifting sand dune; the coral beach at Ardbain, made up of bleached maerl, is known as the “coral beach” because on a sunny day it has a hint of the Caribbean. The history is present in the landscape, starting at the Mezzolithic midden above Sand beach. You can visit the Broch, an Iron Age fortification at the campsite, which was worked on as part of a Time Team dig. Behind the Broch, a Round House is being constructed by locals using Iron Age building techniques, and the Hebridean Barns are being renovated. Further up the path, there are the ruins of the townships at Torgarve, cleared to make way for the sheep farmers. The Heritage Centre, just past Applecross Bay, by Clachan Church, covers the history of the peninsula in detail. There is a comprehensive genealogical archive at the Heritage Centre of particular interest to anyone with connections to the area. Next door is Clachan Church, where St Maelrubha, the Irish saint who landed here in 673 AD established a monastery, second only to Iona as an early Christian centre. The remains of a ruined cross stand at the entrance to the graveyard and the ancient chapel ruin is behind the main building. In the burial ground are skull-and-crossbones gravestones; one theory is that these are connected to the Knights Templars of the Wars of Independence. 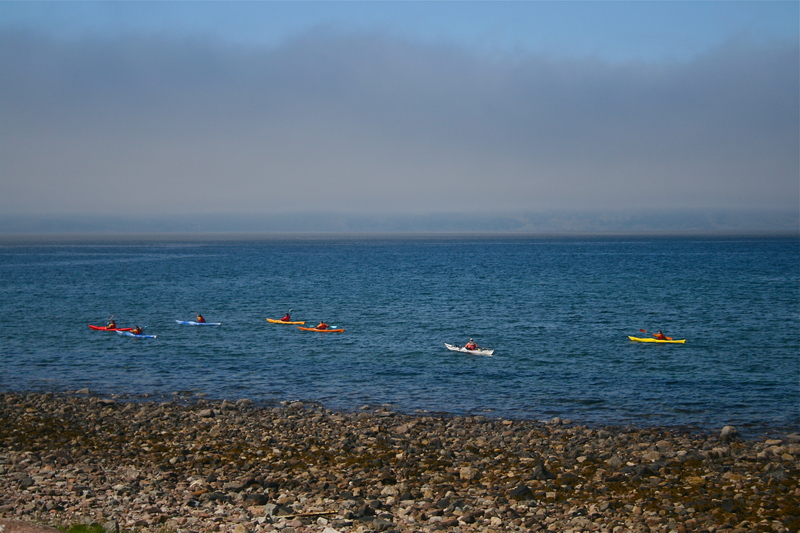 For those looking for more strenuous activities, kayaking around the islands and mountain guiding in both summer and winter are available as is shore fishing for mackerel and pollock. The area is very popular for both pedal and motor bikes, there being the Bealach Beag and Mor cycle challenges which take place in May and September. As for food, you are spoilt for choice. Enjoy the stone-baked pizzas at the campsite in the unique Flower Tunnel; or sample the local produce grown at the Walled Garden, a tranquil and idyllic place to wander; or the Applecross Inn, described in the Observer Magazine as “the ultimate wilderness inn in the Highlands”, with its stunning views across the bay. You can sample venison direct from the hill or the best, fresh shellfish from the Inner Sound, including langoustine, crab, scallops, lobster and squat lobsters. The Applecross Inn in particular is famous for its langoustine, known as Applecross Bay Prawns, which are creel-fished daily – I should know, I’m one of the fishermen! – and any “berried” prawns (those with eggs) go back into the sea, so it’s environmentally sustainable. You can finish your meal with a home-made ice cream, flavours ranging from golden syrup or apple & bramble to whisky & honey. Annual events include the Applecross Games (generally on the third weekend in July), a raft race/barbecue and music night in August, and the new Applestock Festival on the 18th of May 2013. Also a Bardic School and Maelrubha Festival take place in the summer. Information about all these events can be found locally. Applecross still supports a well-stocked village shop and post office in Camusteel, and a medical service as well as a community-owned filling station – visitors are encouraged to fill up with petrol, because all proceeds go into the community. If you would like to go on a shopping spree, that can be arranged as well – framed photography at the Applecross Inn; soaps and perfumes at the Visitor Centre; locally made jewellery, crafts and textiles at the Coal Shed; and along the coast road, woven goods, yarn and woolcrafts at Croft Wools in Cuaig; stained glass at Arrina; and yarns and knitwear at Angora Ecosse at Doire Aonar. When you leave you will take a little of Applecross with you and you will want to come back again and again, as many people do.